We will meet or beat any competitor's written estimate! Maintaining your asphalt not only protects and beautifies, it also increases the value of your home. Your time to buy supplies, prep your driveway, crawl around on your hands and knees filling cracks, painting on tar, cleaning up the mess and buying new sneakers. 1 day $240 of your time plus $160 in supplies. 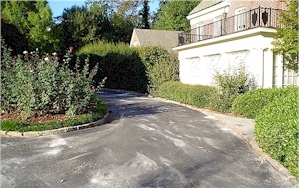 Instead of spending $400 of your own time sealing your driveway, call Northeast Sealcoating. We're Professional Sealcoaters! You know the work will be done right the first time! Call 603-880-4503 tell us your info, we'll get you an estimate within a few days. You don't need to even be there! 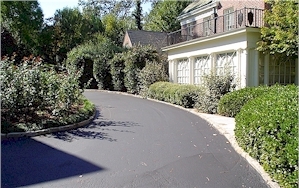 Northeast Sealcoating provides all of your asphalt repairs and pavement maintenance needs. We specialize in asphalt sealcoating, patching, hot crack filling, pot holes, and line striping. We use our experience and the latest equipment available to get the job done right the first time in a timely, cost effective manner. Northeast Sealcoating has been in business since 1996 and our reputation is one that we are very proud of. We have the resources and experience to effectively, efficiently and economically provide those services. Call us Toll Free at 866-342-7975 (MA and NH), 603-880-4503 for a quote or to place an order. You can e-mail us at info@northeastsealcoating.com. Web-site by IVY Technologies, Inc.